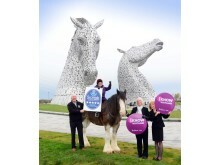 The home of the world’s largest equine sculptures has been awarded five-stars by VisitScotland. 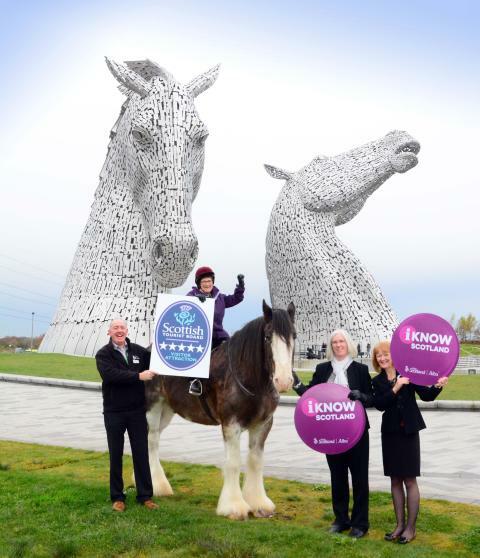 The Helix, an exciting parkland boasting the iconic Kelpies, received five stars from the national tourism organisation’s Quality Assurance (QA) Scheme in recognition of its exceptional standards. The QA Scheme is a benchmark for quality across the tourism industry and operates across accommodation, visitor attractions and food sectors. Located between Falkirk and Grangemouth, the attraction is also part of an impressive network of VisitScotland Information Partners (VIPs) committed to providing local information to visitors. Borne from an idea in 2003 to build an urban regeneration park, The Helix has transformed 350 hectares of unused land into a unique outdoor greenspace which connects 16 communities through its extensive path networks. Run by Falkirk Community Trust, it was opened in 2013 and has been a huge success with great community engagement and a phenomenal 850,000 visitors per year. The Kelpies, two 30-metre-high stainless steel monuments, are a true feat of engineering. Designed by sculptor Andy Scott, their name is inspired by the mythological transforming beasts possessing the strength and endurance of 100 horses. A truly majestic sight, they represent the transformational and sustainably enduring qualities The Helix stands for. As well as the world-renowned sculptures, the park offers a kilometre of new canal, multiple community projects and several high profile events such as Fire and Light. A 16-mile cycle route has also been developed which connects The Kelpies, The Falkirk Wheel and Callendar House. Liz Buchanan MBE, Regional Partnerships Director for VisitScotland, said: “My congratulations go to everyone at The Helix for their commitment to the five star standard. The Kelpies have an international profile, and this award signals that visitors can expect an outstanding experience when they make the trip to visit. “I’m delighted that the Helix has also joined our network of VisitScotland Information Partners. It’s another sign for visitors that they will not just get a friendly welcome, but can also talk to staff about the many other things to see and do in the Falkirk area during their stay. 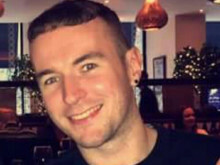 Launched in May 2016, the VIP programme ties in with the national tourism organisation’s global Spirit of Scotland campaign and harnesses the local knowledge, warmth and enthusiasm of partners across the country to help visitors receive the warmest of welcomes and make the most of their trip to Scotland.